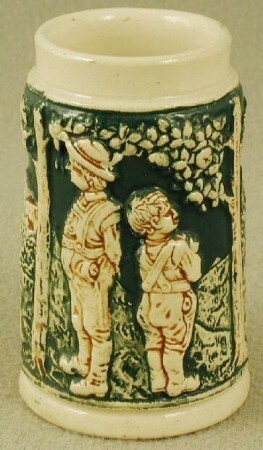 A seldom seen Kinder mug with Polynesian children playing. I have for over a year now placed these three short “notifications” at the bottom of each page! It is now obvious to me the general public never gets that far before wanting to ask me a question on beer stein dollar values. So I have had to move them forward as I am getting tired of copying them and sending them back to people as an answer to their “stein value” questions. This was meant to be an informational web site only. My father was an automobile insurance executive and as such, went to several large conferences a year. Every time he went to one, I would anxiously await the arrival of the ‘goodie bag’ he would bring home for me. One bag in particular seemed like it was huge, at least as I remember it now in my grown up mind. It was full of advertising gimmicks, paper, matchbooks, pens, pencils, “pin backs,” and candy that all the convention displayers had free for the attendees, but I thought of it as treasure! It was later in life that I found out that it is second nature to buy and bring home as a gift some small token of affection for the children, and sometimes for the wife. This keeps the child in anticipation and helps keep the parent in high esteem as a gift giver. 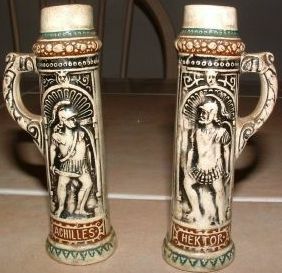 As I started collecting beer steins, these “little guys” always caught my eye at flea markets, but as they were usually inexpensive pottery ones and as I was known (or wanted to be known as) a collector of the finer “stuff,” I would always look at them and return them to the table. 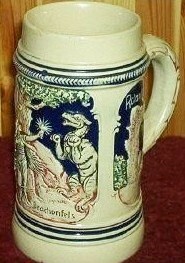 It was at a “Stein Happening” at Ron Fox’s home in New York in the summer of 2002 (that was the beginning of what was to become known as “Beer Stein College) that the thought of starting a new collection of steins overcame me. Seeing some of these on a for sale table, I felt I was missing out on a lot of collecting effort that I could really have fun with, and a pretty inexpensive effort at that. 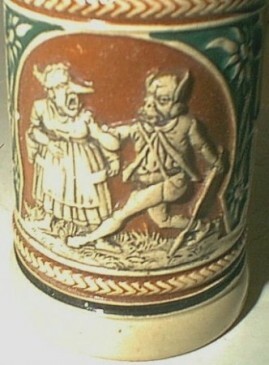 So that is when I decided to add one more ‘sub-set’ to my collecting effort and start collecting “Kinder beer mugs and steins.” Now when the Great Spirit calls me to the Happy Hunting Grounds, I hope any or all, the Smith -Tuohy descendants might pick up on this part of my hobby and pass it along to the next generation. 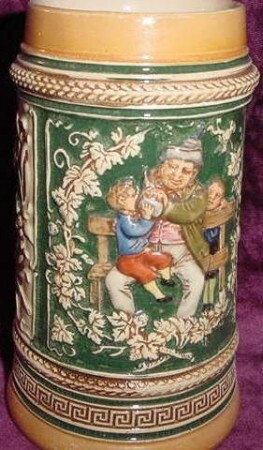 I have collected lots of different things since I started collecting steins and other antiques in 1971. The list is too long to go into here, but every once and awhile, about every two years or so, I just get tired of whatever I’m into at the time. 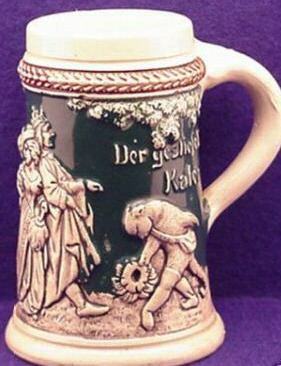 I will then revert back to the old favorite, beer steins. So this is the second reason. It was back to the basics, i.e. 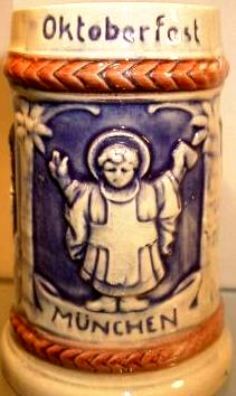 slip poured and molded pottery steins; nothing elaborate like silver or scarce like Guard Corps “Reservists” for me; just simple little clay mugs and steins small children and pre-teens would have liked and used back in the German homeland. Oh, those Tuohy kids, with their green “Irish” hats, are at it again! “GOOD KID’S REWARD” = (Das Gute kind – Dem Guten kinde) This is most often seen with the relief of a small child or maybe a trio of youngsters. This implies: “If you are a good kid we will give you a little of the “hops juice.” As stated before, these mugs, because of their durability, were used for any liquid the parents or grandparents wished the child to drink, even wine on special occasions (4). [L] For the “not so good of a child! 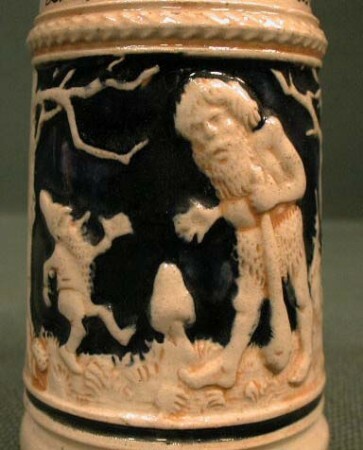 [R] And perhaps the bratty ones got to drink out of the troll mug? Kinder steins and mugs are NOT considered “miniature steins” in my mind! While the differences between the two can be debated and have been, (please see Les Paul’s article in PROSIT, the magazine of Stein Collector’s International, September 2003 edition,) I have found by talking to several miniature stein collectors that they do not consider these Kinderkrugs to be “miniatures, per-se”. 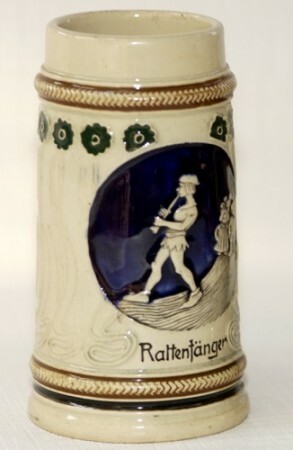 Most collectors of miniatures collect those steins / mugs that are smaller than the 1/8th liter size, which is the size most Kinderkrugs were produced in. 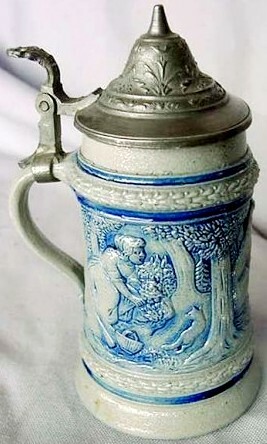 Certainly a ¼ liter beer stein (pre-teen) could not be considered a miniature. 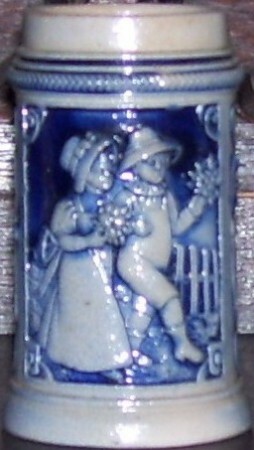 Below are typical 2 ¾ inch tall salt glazed steins that would be considered a miniature but not a “kinder”. It was produced to be displayed and not used. All Kinderkrugs were made to be functional. [L] Very cheaply made, but a “kinde” wouldn’t be able to tell that. 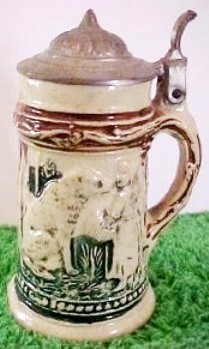 [R] The biggest souvenir mug-stein business was in Munich, and after that city, probably Heidelberg, Nurnberg, and Berlin. 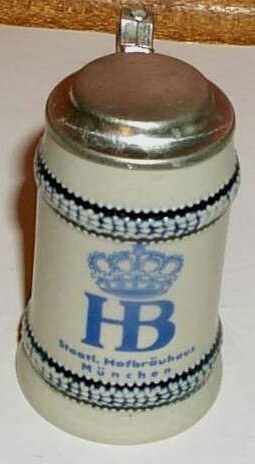 “Hof-brau” stein for Munich, only 3 inches tall. [L] The “Dom” in Berlin – By far the most seen scene is that from Heidelberg and shows the ancient castle on the mountain overlooking the river. All other major German cities such as Berlin and Cologne (Koln) are known to exist. Of course “kinders” from other nearby countries such as Holland and Belgium can also be found. 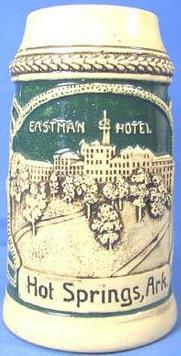 [R] Smaller locations (not cities) such as “Drachenfels” and “The Rheinstein”, the famous mountain and castle on the Rhine, and locations on other major rivers also were popular souvenirs. The National Monument at Rüdesheim is seen a lot also. 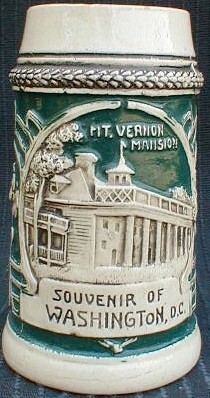 SOUVENIR – WITH BUILDING SCENES. 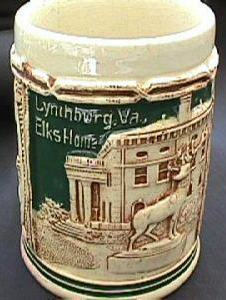 [L] Lynchburg, VA. – Of course American cities are no exception to these tiny wares. Kinderkrug can be found from New York, Washington D.C., and even smaller USA cities such as Indianapolis, Lexington Mass., and as above, in the “Old Dominion” [R] A little place, also in Virginia (Not Washington DC as it says on the mug) … just a little more famous than Lynchburg.. Above: prominent buildings from even smaller American cities. SOUVENIR – WITHOUT BUILDING SCENES. [L} There is a sub set of souvenir mugs that are found that have other decorations on them that does not pertain to the city or town the mug is a souvenir from. 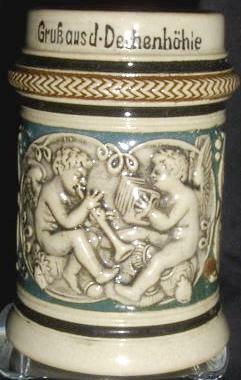 Shown is one such showing cupids with their music, marked “Gruss aus Dechenhöhie”. Others are city stamped on the bottom of the mugs. 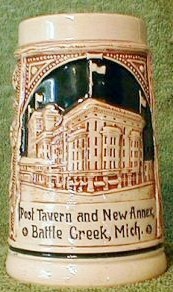 [R] A unusual and scarce kinder showing a US beer made in San Fransisco. 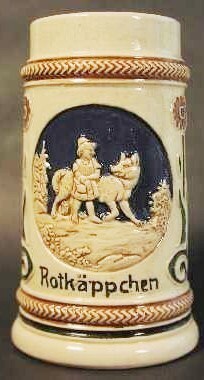 “Red Riding Hood”, “(Rotkäppchen”) –[L] Look at the size of that wolf! 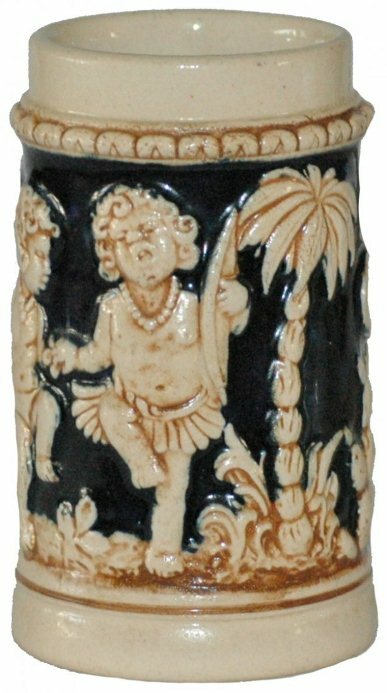 [R] Saltglazed stoneware kinders are not see too often, but it doesn’t make them any more expensive. 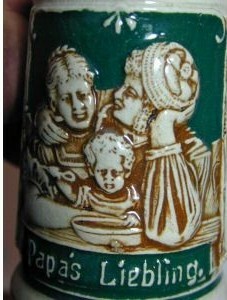 [L] The relief pottery body on this “Red Riding Hood” shows a grandmother surrounded by five children. 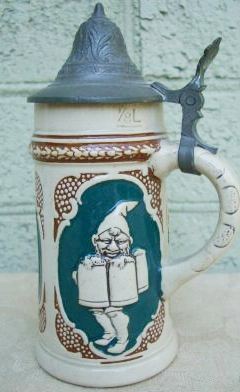 It was still being produced on a series of kinder mugs in “Western Germany” times. However this one is named to Niagara Falls, a little bonus for a kinder collector! 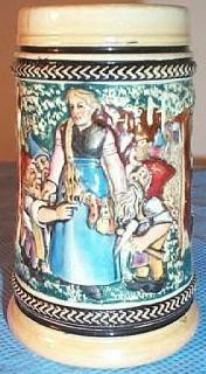 [R] Red Riding Hood scenes far exceed any other fairy tale Kinder mug / stein produced. “Hansel and Gretel” l; [L] lost in the woods. [R] Caught and in the witch’s cage.